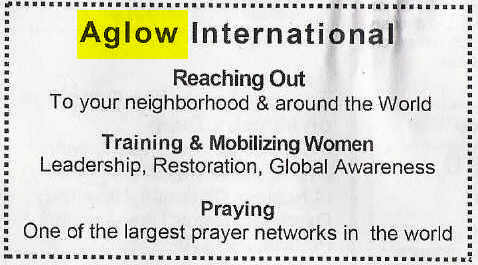 Wonder what to do with yourself sometimes, feel at loose ends somehow, or disconnected from other women spiritually--look up the local chapter of AGLOW INTERNATIONAL. There are many in each state. You will love it, and it could be a life changing experience for you, as it has been for countless women throughout this country and across the world. Not incidentally, a truly remarkable and godly woman named Abigail in Britain has donated $16 million in British pounds sterling to the Daystar Television Network just now, for the ministry of the Gospel to Israel and the world. Her name is significant, is it not? God used a woman with that name to save David from his own anger, which would have provoked some very bad consequences if he had not checked himself and let God deal with Abigail's fool of a husband who had offended David deeply. Abigail ended up David's wife in the palace after her husband was slain by God himself. She is famous to this day. May the donor in Britain by that wonderful name be incredibly blessed in return for the blessing she is spreading across the world by her donation. Evidently, the women in America have more backbone, generally, then the men! They are standing up in defense of liberty and our Constitutional rights while the men are apologizing and backing down and compromising with the enemies of a free America! Shame on us men!